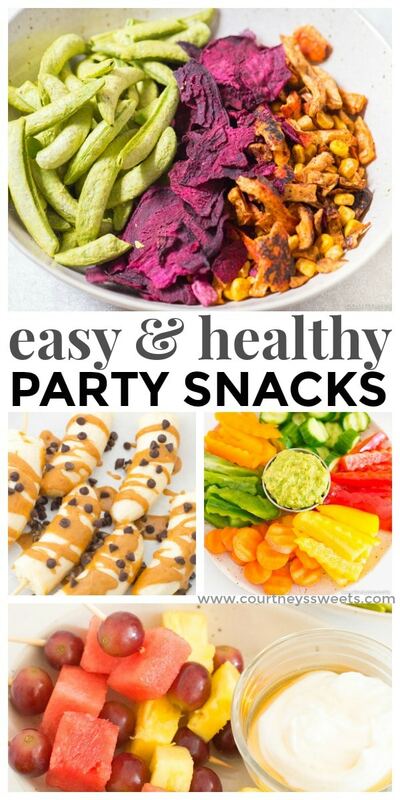 Healthy Party Snacks that are EASY! Freeze Dried Vegetables, Fruit Kebabs, Frozen Chocolate Banana with Peanut Butter, and Crinkle Cut Veggies and Guacamole! 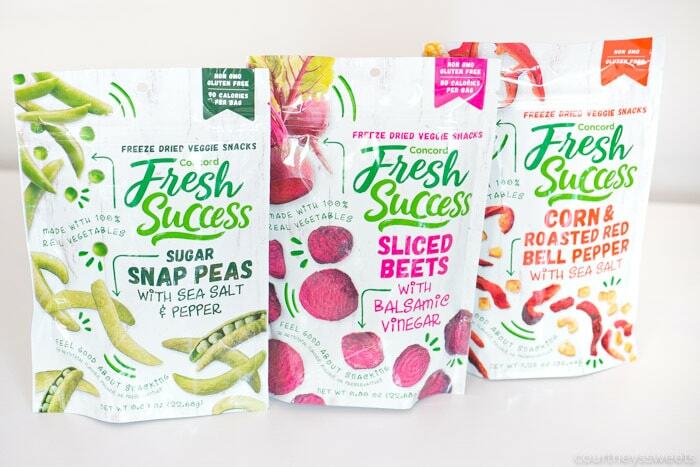 This post is sponsored by Concord Fresh Success. 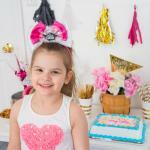 We love throwing parties year round, whether it’s a holiday or just because we miss our friends and family party! We always have good times with friends, family, and of course food! While we always have big meals at parties, the snacks can get overlooked and some can really be filled with calories. When we serve food and party snacks we strive to have something everyone can eat. 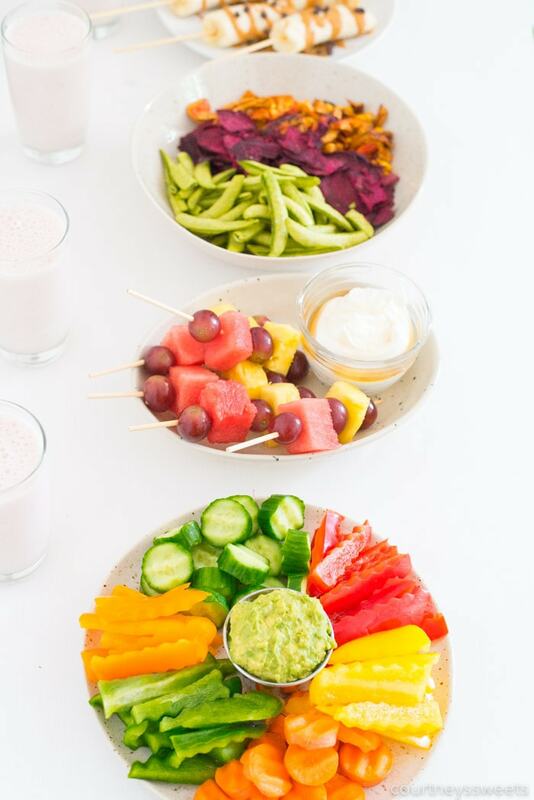 When it comes to snacks we like to serve healthy party snacks that everyone can enjoy whether someone is vegan, vegetarian, dairy free, or even gluten free, we have a bunch of party food ideas for you! 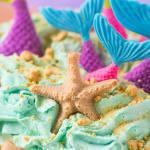 They all make great healthy snacks for kids party or healthy finger food snacks for adults! 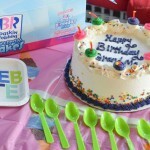 They currently have 3 different varieties 0 all made without artificial flavors, colors, or preservatives. 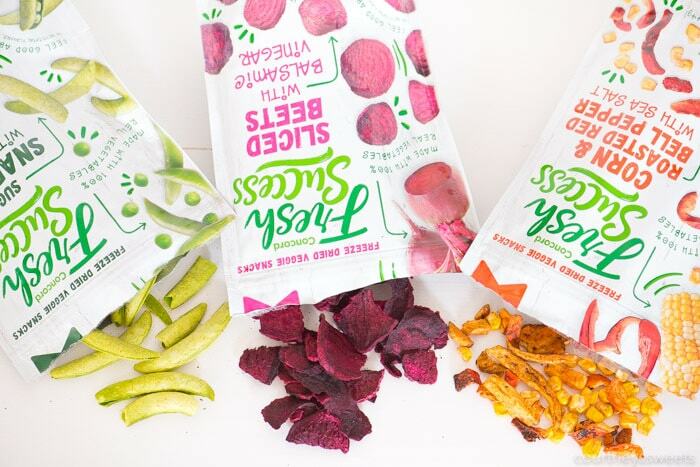 These freeze dried veggie snacks aren’t greasy and make a great alternative to snacking on potato chips. 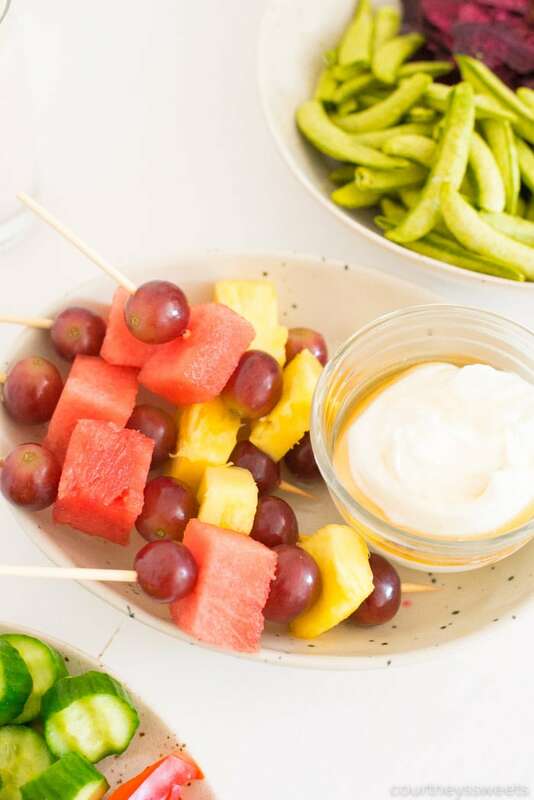 Kids can pick out their favorite fruits to place onto mini bamboo skewers. Kay chose watermelon, grapes, and pineapple. 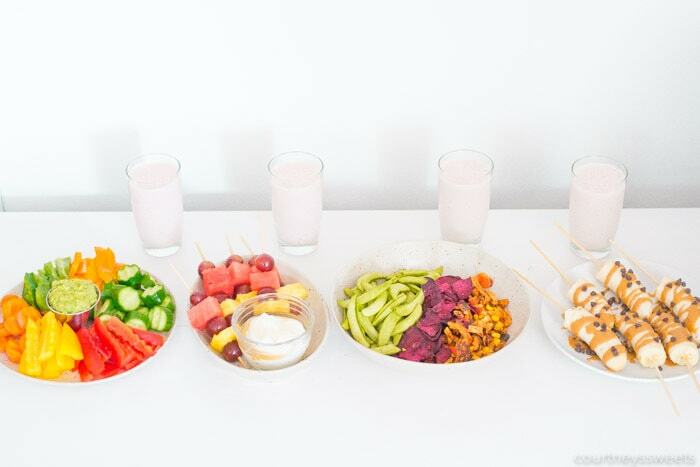 The fruit kebabs are great on their own, but we also like to serve with a little maple syrup and greek yogurt. 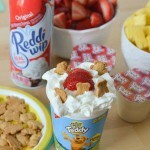 It makes for a delicious fruit dip! If your kiddo pushes away fresh vegetables try cutting them into fun shapes using cookie cutters or even use a crinkle cut vegetable slicer. Fun shapes make food even more fun! We serve with a kid friendly guacamole, avocado mashed with a little salt and lime. We used Concord Foods Strawberry Smoothie Mix with kefir (a probiotic rich yogurt drink), frozen bananas, frozen strawberries, and a little water so it’s not too thick. Smoothies are super delicious and a great way to get some probiotics in when your kiddo doesn’t enjoy kefir plain. 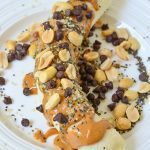 Another great way to get some protein and fruit in for a snack at parties is our frozen chocolate banana with peanut butter drizzle! 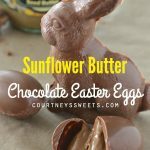 We use allergy friendly chocolate chips and if you have someone with a peanut allergy you can even use a sunflower seed butter instead. To make these just place a piece of parchment paper onto a small cookie sheet. Cut the bananas in half. Then you’ll stick a popsicle stick right into the banana and freeze until the bananas are frozen. 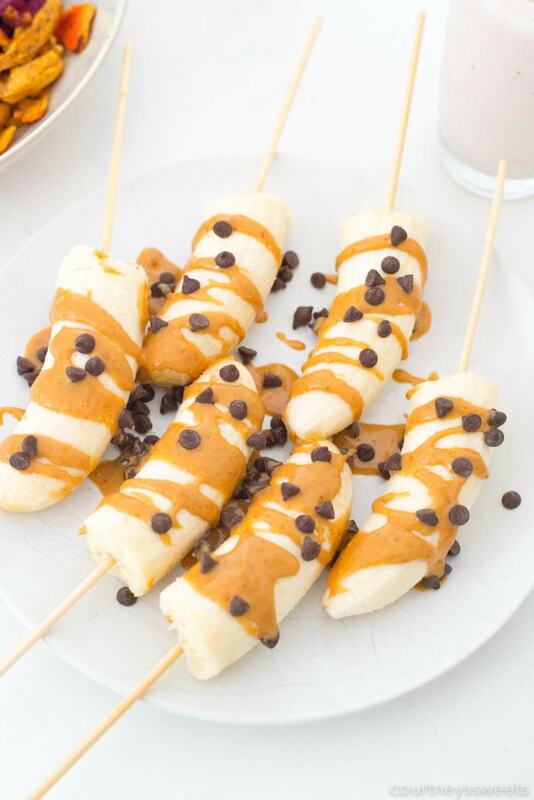 Once the bananas are frozen take them out and drizzle with peanut butter and sprinkle with chocolate chips. 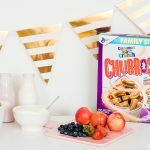 Frozen Yogurt Fruit Bark – one of our absolute favorite recipes, you can use any fruit you like! for even more flavor add a packet of Concord Foods smoothie mix to the yogurt. 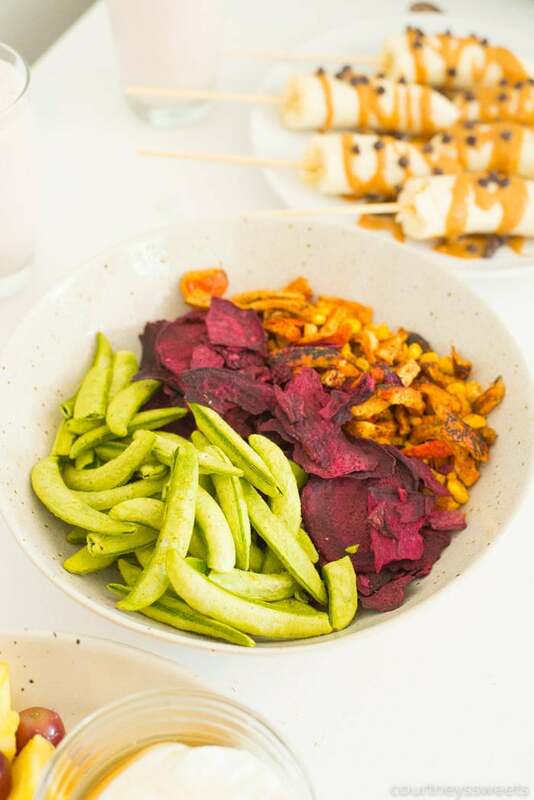 Chilled Veggie Dip in a Bowl – this would go great with the freeze dried vegetables or the crinkle cut veggies. 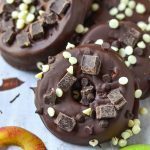 Caramel Apple Dip – super easy recipe and uses dates, not sugar, win! Cranberry Coconut Energy Bites – you can easily switch the cranberries to other dried fruits. 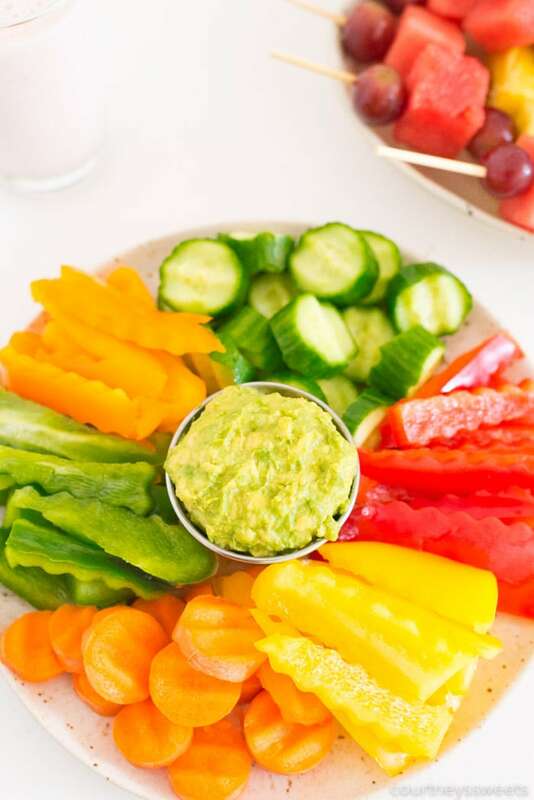 Rainbow Veggie Wraps – so colorful and nutritious.